A month or two ago I wrote about our shed design – here, here and here. I was very lucky to have a friend of mine, who is a shop Teacher, build it for us with his class. I wanted a shed that would be relatively lightweight and portable. It has made it’s journey home, but we have not assembled it yet. When we do, it will be at the campsite and I will document the assembly process – for those of you who are curious about the design. In the meantime, I wanted to share with you how we spruced up the shed with outdoor chalkboard paint. First off, my kids love playing with chalk. 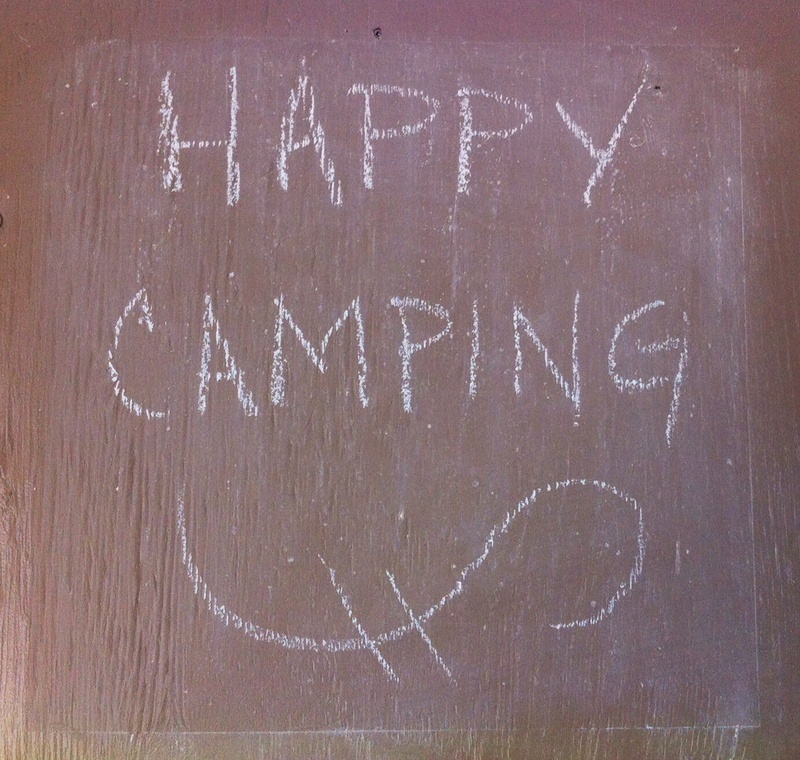 We wanted to find a way that they could continue to use chalk at the campsite, but as you can imagine, gravel roads are not conducive to chalk. So, we googled it and quickly found out that outdoor chalkboard paint does not exist. We needed a plan B. A little further research led us to a recipe for homemade outdoor chalkboard paint. We decided to use the shed walls as our canvas. I wasn’t 100% convinced that it would work properly and I didn’t want the chalkboard to stick out like a sore thumb, so we chose to paint the chalkboard sections the same colour that we used on the shed. It could not have been simpler. Step 1 – Start with flat-finish latex paint in any shade. For small areas, such as a door panel, mix 1 cup at a time. Pour 1 cup of paint into a container. Add 2 tablespoons of unsanded tile grout. Mix with a paint stirrer, carefully breaking up clumps. Step 2 – Apply paint with a roller or a sponge paintbrush to a primed or painted surface. Work in small sections, going over the same spot several times to ensure full, even coverage. Let dry. Step 3 – Smooth area with 150-grit sandpaper, and wipe off dust. Step 4 – To condition, rub the side of a piece of chalk over entire surface. Wipe away residue with a barely damp sponge. The instructions and recipe can be found on the Martha Stewart website. This entry was posted in Trailer Organization, Modifications & Storage Solutions and tagged Camping, Chalk, Chalkboard, Chalkboard Paint, Craft, Design, DIY, Family, How-To, Projects, RV, Shed, Storage, Trailer. Bookmark the permalink.